NOISE-INDUCED hearing loss is the most prevalent, permanent, yet preventable injury in the world, affecting 250m people worldwide. Tinnitus, ringing or buzzing in the ears, is reported by the World Health Organisation to be the third most serious non-fatal medical condition. In the workplace, excess noise is one of the most universal hazards, causing irreversible hearing impairment, yet it’s a hazard that is often underestimated by both employers and employees. Approximately 30 per cent of workers may be exposed to hazardous levels of noise at some point during their working day, with over 10 per cent always exposed to noise. According to Action on Hearing Loss, one in six people (11m) in the UK has hearing loss or is deaf, a number that is predicted to rise to one in five by 2035. One in 10 UK adults is estimated to suffer from tinnitus. Contrary to popular belief, hearing loss is not inevitable. It can be completely prevented by reducing the risk of harmful noise at source, or by wearing correctly-fitted protective equipment, backed up by training on its proper use. Permanent hearing loss involves damage to the sensory cells responsible for hearing. Once these are damaged, they cannot be regenerated by medicinal or surgical means. Noise-induced hearing loss develops slowly, gradually and painlessly and is often unnoticed until it is too late – it can take 10 to 20 years for long-term damage to become apparent. Loss or impairment of hearing typically begins in the frequency range of human voices, interfering with spoken communications. The social effects of hearing impairment produced by excessive noise can adversely affect family life, the quality of life and lifestyle of both the victim and their families. Noise creates stress, interferes with communication and acts as a distraction. Sufferers can end up feeling stigmatised, alienated and isolated from their social circles, a feeling exacerbated by potential deterioration of their speech, and may also be unhappy in their work life. These repercussions are often not talked about in the workplace. Economically, those with loss of hearing are likely to be more vulnerable to accidents, and find the job harder, leading to reduced productivity. They may also be at an educational disadvantage. Sufferers may take more risks than they should, as a difficulty in hearing warnings or instructions can lead to frustration and an inability to hear alarms can lead to danger. In extreme cases, individuals face a potential reduction in income by being unable to work or keep their jobs. Finally, there may be extra financial costs to be borne by the employer in terms of supplying hearing aids to individuals. As the workplace has become more and more mechanised, with machinery being used in almost every working environment from car manufacturing, farming, food processing to recycling and factories, not to mention the engineering and construction industries, so the noise levels have gradually increased, thereby exposing any employee to more noise. Routine maintenance of plant and equipment can certainly help with reducing the noise at source. Due to the gravity of hearing loss, hearing protection has been reclassified under EU law. The new regulation is a binding legislative Act which is applied automatically to the whole of the EU whereas a directive needs to be transposed into each member states national law. The reclassification from Category II (Intermediate) to the more stringent Category III (Complex) under the new PPE Regulation (EU) 2016/425, came into force in April this year. Category III applies to risks that cause very serious consequences such as death or irreversible damage to health and escalates the severity or impact of the consequences of the risk. This upgrade to Category III means that hearing protection must now be treated as seriously as protection from asbestos, ionising radiation, electric shocks, falls from height, bullets and knives, and drowning. It is a wakeup call for both employers and employees who may suffer from excess noise and underlines the need for employers to communicate and consult with their workforce about noise levels. The reclassification of hearing protection is an increase in PPE status. It will further help to improve the safety of the products on the market eliminating counterfeit or poor quality products by ensuring that all PPE brought into the European market conforms to the new Regulation and is therefore, to a relevant and current standard. Products classed as Category II must be submitted for testing to gain CE approval but do not need to be retested. Products in Category III must also go through this initial test and then continue to meet the requirements of the standard with ongoing surveillance testing. This requires samples to be submitted for testing annually, unless manufactured under ISO 9001 or other accredited quality management system. Products must also continue to meet the requirements of the latest version of the standards. The new PPE Regulation places obligations not only on manufacturers, but also on the whole supply chain – importers, suppliers, marketers and distributors of PPE – to ensure products continue to meet the requirements of the latest version of the standard. Thresholds of noise exposure which require employers to take specific action if they are exceeded, are lower than people might think. Noise exposure should be measured and checked against the lower and upper Exposure Action Values (EAVs) as defined in the Control of Noise at Work Regulations 2005. If the noise cannot be reduced at source, then adequate hearing protection needs to be considered, this should be selected to match the protection required to bring the exposure down to an acceptable level. The hearing protection selected also needs to be suitable for the wearer and the environment it is to be used in. It needs to be easy to fit correctly, compatible with other PPE or equipment, hygienic and practical. Lower and upper EAVs are an average of 80 and 85 decibels (dB) respectively measured over a day or a week. Exposure limit values are a daily or weekly average exposure of 87 dB and a peak sound pressure of 140dB. Noise exposure must not exceed these levels. 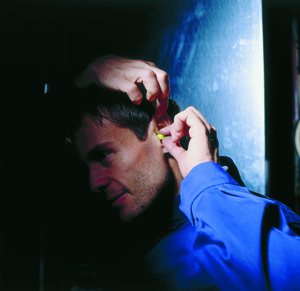 Many different types of protection are available, such as disposable or reusable earplugs, earmuffs, canal caps and bespoke models. Selecting the most appropriate hearing protection is not straightforward, the wearer, the environment, the task and activity all need to be considered, as well as the protection afforded. The objective is to achieve an effective residual noise level of between 70 and 75dB once protection is correctly fitted. If the wearer is over-protected with a device that gives too much sound absorption, this can result in an inability to communicate and cause feelings of isolation. Whatever type of hearing protector is used, accurate fitting is crucial or the devices will give workers a false sense of security. The product must be comfortable and suit the individual and shape of their ear canal. Without these two factors, employee compliance levels drop, and the intended optimum protection level is not achieved, rendering the hearing protection pointless. Finally, and no less importantly, employees should be trained in how to correctly fit and use their ear protection and look after it, ensuring it remains clean and undamaged. It is not difficult to protect employees hearing. Hearing loss should not be considered inevitable, or just accepted as part of ageing. Excessive noise is not the norm, it needs to be taken more seriously. But the invisibility and long latency of noise often work against recognition and therefore action being taken. However, the upgrading of hearing PPE to Category III is a positive step to this devastating and irreversible condition being given the recognition it deserves. The importance of providing protection for employees’ hearing will no longer be able to be ignored.